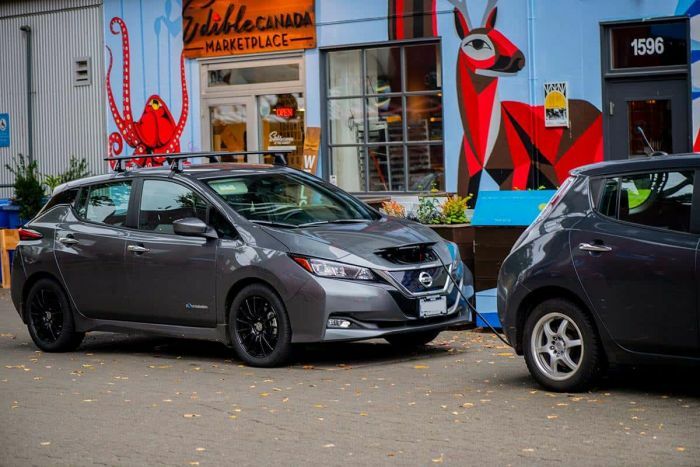 Robert Ouimet, a 2018 Nissan Leaf owner from Canada, shares his experience of putting a roof rack on a 2018 Leaf and what he has learned from installing it. If you are thinking of putting a roof rack on your 2018 Leaf, here's what I learned today. We had a Thule rack fit for our Toyota. Normally you'd get a new 'fit-pack' for the rack pillars and maybe you'd also have to upgrade the pillars, but in most cases, can do a change to fit a new car. However, Thule is still working on a fit pack for the 2018 Leaf, expected in January. Our dealer in North Vancouver expects delivery end of Jan.
Yakima has a fit kit now, so we ended up trading in our pillars and bars for a new Yakima rack - our dealer gave us 30% of original value for our used rack so I took that deal instead of trying to sell on Craigslist.